With our flat flexible cables you can save in your most valued resource, weight. Weight save comes without compromises in technical performance. Our products are divided into standard and OEM products. Our standard products are cables and connectors, which can be used with existing appliances. On standard cables, the connectors are designed to reference connectors (Hirose FH12), so they are safe choice for existing designs. For more detailed information, see our Standard Cables -page. We can use different types of connectors, depending on the need. If connectors are not required, we have multiple options for the plating. 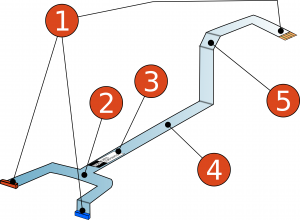 The routing of the cables can include Y-sections, cross-sections. The branding of the cable can be customized depending on your need. These can include customer info, QR-codes and serial numbers. There are several substrate materials to choose from, such as PET, Polyimide and others. Bending of the cables is the best feature of flat flexible cables. We can also include pre-formed bends in the cables. New Cable Corporation products are made in Finland in our Oulu factories. We have flexible MOQ, size does not matter, since our world is flat ! We do design our OEM cables and work hand in hand with graphic designers. 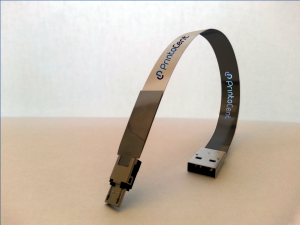 Flat cables offer more surface area to show your brand! Different shielding performance and a wide range of insulator materials are also available.